Tamworth residents are invited to take part in a large and ambitious community art project to create a huge Mercian mosaic on the lower lawn of Tamworth Castle Grounds. 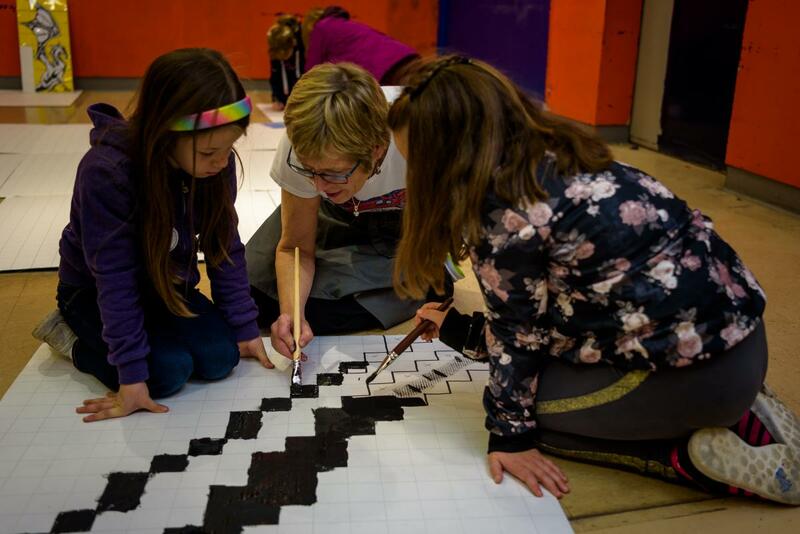 Mercian Mosaic will see 1,400 individual square yard tiles being decorated by people of all ages and brought together to create a large and striking Saxon-themed image. Hundreds of tiles have already been completed by hundreds of willing volunteers from across the town, including from schools, church and community groups, sheltered housing schemes and art groups. The intricate 70-yard by 20-yard mosaic has been designed by Tamworth artist Maggie Carney who has spent the last 12 months living and breathing the project; co-ordinating volunteers and allocating designs. Maggie has set up a base of operations in Ankerside Shopping Centre in the former Argos unit where many of the completed tiles are on display. Whenever Maggie is in residence, people are invited to pop in, have a look and even get creative if they want to. A series of open workshops have been organised during the February half term when volunteers of all ages and abilities are invited to pop in and help take the project to the final stages. Sessions take place in the Ankerside Shopping Centre unit on February 21, 22 and 23 from 10am to 12pm and from 1pm to 3pm each day. Anyone who would like to take part is invited to drop in and help decorate tiles. The striking overall design features key elements of the town’s Anglo Saxon history, incorporating its landmark buildings, rivers and people, as well as details such as Tamworth pigs, dragons, fish, the Staffordshire knot and Mercian flag. At the centre is Tamworth’s ‘Lady of the Mercians’ Aethelflaed, who played a pivotal role in English history by building a chain of fortifications against Viking invaders throughout the Kingdom of Mercia. Her fortification of Tamworth in 913 AD became the forerunner to Tamworth Castle. Daughter of Alfred the Great, Aethelflaed’s accession as a female ruler has been described as one of the most unique events in early medieval history. This year marks the 1100th anniversary of Aethelflaed’s death in Tamworth and the mosaic will be laid out on the lower lawn of the Castle Grounds for one day on Saturday, July 14, as part of a weekend of celebrations to mark the occasion. Mercian Mosaic is one of several initiatives taking place as part of Arts in Unusual Spaces – a two-year scheme made possible with funding from Arts Council England to bring art to new and interesting spaces across the town. Maggie, a retired school teacher and freelance artist, has worked with Tamworth Borough Council’s Arts & Events team before and previously created the stained glass window mosaic design that was transferred onto fabric and unfurled from the Castle Grounds Bandstand as part of the dramatic outdoor performance of Tigress in 2015. And while she has enjoyed a long and successful career, Mercian Mosaic is the biggest project she has taken on to date. Cllr Joy Goodall, Tamworth Borough Council’s Cabinet member for Environment and Culture, said: “This is a huge project envisioned and developed by the Arts and Events team and brought to life by Maggie and her unrelenting efforts. The project is giving hundreds of people of all ages the chance to come together, get creative and contribute towards something that will be an amazing community effort. Jeff Wigley, Ankerside Shopping Centre manager, said: “It’s been a delight to have Maggie at the centre as part of the Mercian Mosaic project and we’re looking forward to seeing her host the workshops during the half term holidays.